Customized Massage to Fit Your Body. I absolutely love Thanksgiving! I took all of the preparation for granted when I was a child but always loved the family gathering around. Mom would be in the kitchen with her apron on using all four burners on the stove whipping up delicious mashed potatoes, a few vegetables and a pot of gravy. The oven would be stuffed with the biggest Butterball turkey she could wrestle home from the store. She made a simple bread stuffing . . . not the fancy kind with sausage, cranberries or nuts . . .just caramelized onions, celery, poultry seasoning, butter and a little chicken broth tossed into a couple of bags of Pepperidge Farm bread stuffing and baked in the oven for an hour or so. My brother Scott liked it chunky and on the dry side. I liked it moist and the bread chunks were undistinguishable from the remainder of the ingredients. Years later with families of our own, mom made two trays of it . . . one the way Scott liked it and one the moister way, which was better. One year my grandparents brought chocolate ice cream turkeys for each of us kids. I had never seen anything like it! 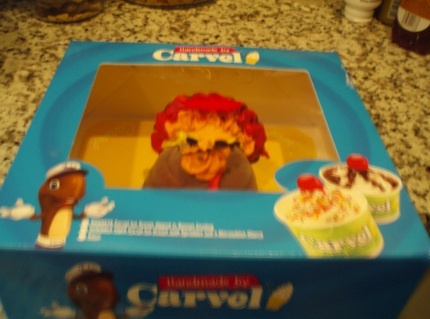 I was going to have an individual chocolate turkey ice cream novelty from the Carvel store! I was so blessed! Ice cream of every form is still my drug of choice to this day. Not a Thanksgiving passes that I don’t think of that special time when my grandparents were here with us. When they rang the bell after making the long trek up from their retirement village in Toms River, there was a lot of commotion. The dog was running around and chasing her tail like she was receiving a prized chocolate turkey, the kids were squealing with delight. They were here! The days that followed were sometimes somber. Mom’s back was ‘out’ from lifting the bird in and out of the oven, and we were all feeling guilty from over-eating. The holiday food coma would commence and we would blame it on the turkey for making us tired and achy. Massage was not well known as a remedy for muscle pain in the 60’s and 70’s in New Jersey. Mom soldiered on until Christmas and would make a ham or something smaller due to the memory of the excruciating pain in her back. But times have changed and massage is known to reduce or eliminate back pain due to muscle soreness, or in mom’s case lifting a heavy turkey. The good news is that you don’t have to live with back pain from fall activities such as lifting the bird, raking leaves or shopping until you drop. I often compare my love of Thanksgiving and my love of ice cream turkeys to the love I have for massage. Both make you feel amazing but one doesn’t have any calories. A preemptive therapeutic massage prior to the big day will help you relieve stress and combat tension so you will be looking and feeling your best. I am thankful that I get to wake up in Charlotte every day and work at a job that I absolutely love! It challenges me, it’s never boring and I’m able to help people get out of pain. I am truly thankful for the life I live and the people in it. Candy Benish is a licensed massage therapist in Charlotte North Carolina.